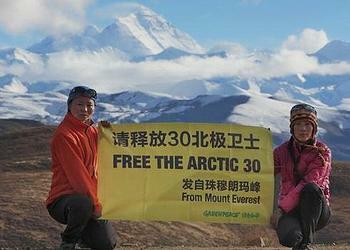 Burmese parliamentarian and opposition leader Aung San Suu Kyi today expressed her support for the Greenpeace Arctic 30. The 1991 Nobel Peace Prize Laureate who spent decades in jail and under house arrest, Suu Kyi joins 11 other Peace Prize Laureates in calling for the release of the 28 activists and two journalists. The 30 women and men were arrested by Russian law enforcement officials September 19 following a protest against an Arctic oil platform in the Pechora Sea, a section of the Barents Sea off northern Russia, within Russia’s Exclusive Economic Zone. Greenpeace says this location makes the arrest of the Arctic 30 and seizure of their Dutch-flagged ship, the Arctic Sunrise, illegal because the UN Convention on the Law of the Sea guarantees foreign vessels the freedom to navigate in the Exclusive Economic Zone of another country without interference. The Prirazlomnaya platform targeted by the Greenpeace protest was being used by Gazprom, the world’s largest extractor of natural gas. The Russian government controls most of the Gazprom shares and private parties hold the rest. Gazprom plans to start production from the Prirazlomnaya platform in the first quarter of 2014. The Prirazlomnoye development would become the first hydrocarbon production project on the Russian Arctic shelf. Now the Arctic 30 are being moved from the detention center in Murmansk where they have been held since their arrest to a jail in St. Petersburg, says Greenpeace International. Lawyers for Greenpeace are not aware of the reasons for the move. Prosecuting authorities in Russia have failed to lift charges of piracy against the Arctic 30, despite announcing they would do so. Russia’s powerful Investigative Committee announced last week that the piracy charges – which carry a 15-year jail sentence – would be replaced with charges of hooliganism. But when the 30 detainees were brought before the Committee over the course of the past week, the piracy charge was not withdrawn. Instead each of them was served with the additional charge of hooliganism, which carries a maximum sentence of seven years. They now stand accused of both offenses. 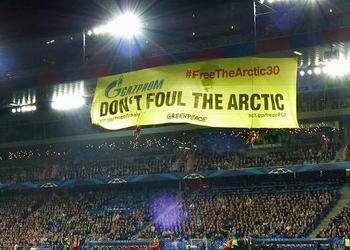 Greenpeace rejects all charges and argues that the activists protested peacefully. 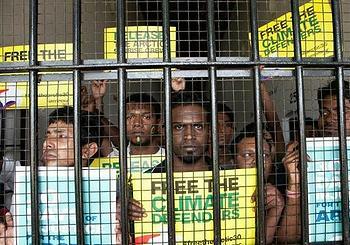 On the October 18, as the Arctic 30 faced their 30th day of imprisonment, nearly 10,000 people took to the streets at 85 events in 36 cities to call for their immediate release. Their efforts apparently fell on deaf ears. On October 23, the Russian Foreign Ministry announced that it will not accept an international arbitration process at which the Netherlands is seeking the release of the Greenpeace International ship Arctic Sunrise and its crew under the UN Convention on the Law of the Sea, to which both Russia and The Netherlands are States Parties. David Anderson of the United Kingdom was on Monday appointed an ad hoc judge of the International Tribunal for the Law of the Sea in the case against Russia’s detention of Greenpeace activists, to be heard by the tribunal on Wednesday. “Gazprom is Russia’s most prepared company that has the experience and technical means for independently implementing offshore projects in the Arctic: from geological and geophysical studies to field commissioning,” declared Golubev at an oil and gas industry conference and trade show. The southern half of the Barents Sea, including the Russian port of Murmansk, remains ice-free year round due to the warm North Atlantic drift.